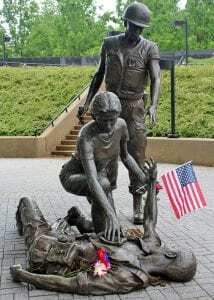 This year, on National Vietnam War Veterans Day on March 29, the New Jersey Vietnam Veterans’ Memorial Foundation will be inducting twenty individuals into our In Memory program. In Memory is a unique program that honors New Jersey men and women who served and died as a result of the war in Vietnam. This program was initiated to honor these veterans and civilians. Their names will be placed on an engraved stone inside the Memorial so that all who visit will know that they are with their honored comrades. This event is free and open to the public. We invite our community to join us in commemorating the lives and legacies of those we’ve lost to the effects of the Vietnam War. Click here for more information on the In Memory program.